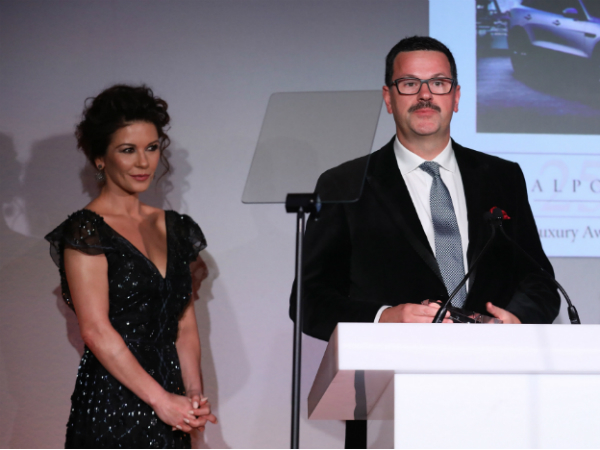 Jaguar Land Rover scooped the award for Excellence in Exporting British Luxury at the 16th annual Walpole British Luxury Awards, hosted by award-winning actress Catherine Zeta-Jones (pictured), last night. The Excellence in Exporting British Luxury award is presented every year by Walpole to the company judged to have been most remarkable in distributing British luxury goods and services overseas. The award was collected on behalf of the company by Ken McConomy, Head of UK PR (pictured). Walpole, a not-for-profit organisation which promotes British luxury brands, has been holding the awards since 2001, bringing together CEOs and creatives to celebrate what it is that makes British luxury the world leader it is today. Winners were selected by an expert panel of judges from the luxury industry led by Michael Ward, MD of Harrods and Walpole’s Chairman; Gillian de Bono, Editor of FT How to Spend It; Hannah Rothschild, Chair of The National Gallery’s Board of Trustees; Stefan Sielaff, Design Director at Bentley; Marcus Wareing, Chef Patron of two-Michelin starred Marcus; Henrietta Jowitt, Deputy Director General, CBI; and Tim Delaney, Chairman of Leagas Delaney.